Last week I kicked off summer with Strawberry Lemonade. This week I’ve got a fresh take on another summer classic: potato salad. My mom is not much of a cook. In fact, she doesn’t care much about eating. She’s happy with a hand handful of almonds and a can of sardines (I kid you not). Whatever gets good nutrients in is good enough for her. I learned everything about food—including having a passion for it—from my father and grandmother. That said, my mom has always made a killer Greek-style potato salad. Go figure. Much like German-style potato salad, Greek-style is made with oil and vinegar instead of mayonnaise. It also has hunks of perfectly ripe tomato and red onion. That’s pretty much it. Sound too basic to be good? Think again. You’ll trade in mayo-laced spuds after just one try. Either way, give this a try for lunch, dinner or even a picnic. Enjoy! 1. Make the quick-pickled red onions: put onions in a saucepan with enough water to cover them. Bring to a boil, then drain, setting the saucepan aside. Place the softened onions in a non-reactive bowl and set aside. 2. Mix together vinegar, ½ cup water, spices, salt and sugar in the saucepan. Bring to a boil before taking off of the heat. Pour the vinegar mixture over the onions and let cool. Cover and refrigerate for at least 2 hours. This should make about 1 cup of pickled onions—exactly what you need for this recipe. These will keep in an airtight container in the fridge for up to a month. 3. Make the salad: boil potatoes until they are well cooked through. Drain and let them cool before cutting into 1-2″ chunks. 4. Cut the tomatoes. I like fat wedges that hold up nicely in a bowl of hearty potatoes. 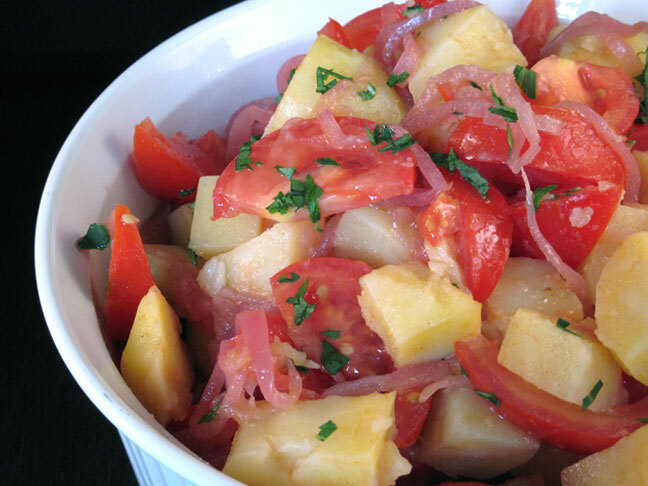 Combine potatoes, tomatoes and pickled red onions in a large bowl. 4. Whisk together olive oil, lemon juice, vinegar, mustard and salt to make the dressing. Pour the dressing over the vegetables and toss. You can serve this right away, but I find this salad tastiest once chilled.